Or, more specifically, their National poly brood boxes. I’ve just invested in some of these to help some of my colonies overwinter. This was prompted by how well colonies housed in Thorne’s Everynuc’s did last winter when compared to full colonies in cedar boxes. I’ll do a wholly unscientific side-by-side test of colonies in cedar or poly brood boxes to see how they compare. 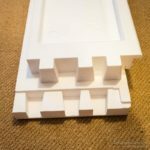 There are a number of polystyrene hives now available in the UK, with offerings from many of the major suppliers. I’ve commented on some of the available poly nucs previously. If, like me, you’re wedded to (or stuck with, depending upon your outlook) National size frames then the choice is a bit more restricted, but is increasing year-by-year. Paynes and Maisemore’s have sold their own designs for some time and Abelo has recently introduced one which is receiving favourable reviews. Of these, I believe the first two are at least partially compatible with cedar boxes, whilst the Abelo is advertised as having the same ‘footprint’ as a cedar box. I’ve not owned any of these so can’t comment further. However, I have owned some Paradise honey/ModernBeekeeping poly National hives for a few years but, despite the quality of the dense poly, have never been happy with the design. The brood boxes are too narrow for the length of the frame top bars and they have an infuriating ‘lip’ or overhang at the bottom of the box. 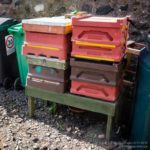 This makes them incompatible with cedar components – for example when expanding a colony up to a double brood box – and means it is almost inevitable that bees with be squidged when re-assembling the hive. I’ve previously illustrated these design issues and now only use these boxes as bait hives or as a last resort. I should add that, as bait hives, they are excellent. 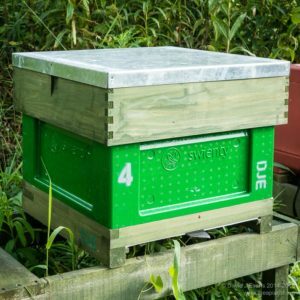 The other well established company selling National poly hives are Swienty of Denmark. I already have several of their supers – bought secondhand and still going strong – which I mix’n’match with my motley collection of cedar broods, queen excluders, crownboards and roofs, so it was a logical choice to buy Swienty brood boxes as well. I bought mine from C. Wynn Jones who, as usual, delivered them well-packed and very promptly. The design has been updated in the last couple of years and now includes press-in frame runners. 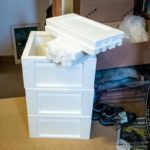 The boxes are supplied flat-packed and can be assembled in minutes. They are bottom bee space, have handles molded into all four faces and are made from dense and strong polystyrene. Importantly, as far as compatibility is concerned, the top and bottom of the boxes are flat and the external dimensions are 18″/46cm square. They are therefore compatible with the homemade crownboards, floors and insulated roofs I use. Due to the thickness of the polystyrene the internal dimensions are slightly smaller than a cedar box. This means that they will only accommodate 10 frames, rather than the usual 11 plus a dummy board. You’ll read descriptions of these boxes being “45 mm” thick (for example on the Solway Bee Supplies and C. Wynne Jones’s sites). They’re not. What it should say is that they’re a maximum of 45 mm thick. 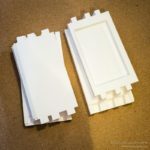 The upper and lower edge of the box is either 40 mm or 45 mm thick (on the ends and sides respectively). However, the majority (75% by area) of all four sides of the box is recessed and is only 29mm thick. In contrast, the Everynuc from Thorne’s has 40 mm thick walls. The ‘old style’ Swienty boxes (my supers are stamped Swienty/Denrosa and are at least 5 years old) are 40+ mm throughout, other than the recesses for the handholds. Swienty National brood boxes weigh about 1.3 kg unpainted. For comparison, a Thorne’s second quality cedar brood box weighs about 3.5 kg. In the overall scheme of things the ~5 lb difference is probably irrelevant when it comes to hefting full boxes about. It’s worth also noting here that poly hives can be repaired using Gorilla glue and wooden dowels should anything catastrophic happen. I’ve previously spray painted poly nucs with external masonry paint. This works well but since I ran out of paint and have got a bit tired of the colour I decided to use a different approach this time. After consulting the friendly and courteous correspondents on the SBAi forum I’ve used Hammerite Garage Door paint. 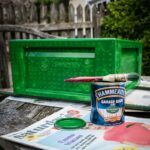 This is a solvent based paint, available in 750 ml tins for ~£13 in a range of colours, including a rich ‘Buckingham Green’ and a rather striking ‘Oxford Blue’. Being solvent based it reacts very slightly with the polystyrene, forming an impervious bond, so shouldn’t flake off as some masonry paints do. I used a brush to apply two coats, 24 to 48 hours apart. The first coat looks pretty patchy but might have been acceptable if I’d taken a bit more care. The second coat improved things considerably. I finally added hive numbers to the back and front faces (which look almost identical to the sides) to help me orientate the boxes and refer to them in my records. For reference, 2/3rd of a tin is sufficient to do two coats on eight of these broods. The nominal coverage per litre is 8m2. 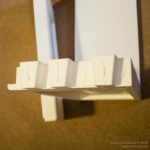 † The well-known ESBA Apiarist has a post on assembling the old-style Swienty/Denrosa brood boxes. These lack the frame runners the current design has. In the post he describes using varnish to protect the recess where the frame lugs sit, an area that would inevitably get heavily propilised and require scraping clean. This should be less of an issue with the new-style boxes. 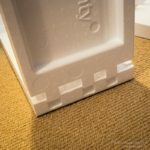 In a related posting on the SBAi forum Calluna4u – who is very familiar with these boxes – gives an additional reason for protecting the polystyrene in the frame lug rebate area. Since the poly is thinner here there is the possibility of light getting in – either due to translucence or because the edge of the box isn’t kept obsessively clean. The bees tended to chew this area. Varnishing helps protect the poly. I didn’t use varnish, but did paint this area to reduce any translucence. This entry was posted in Beekeeping, Hives and nucs and tagged brood box, hive, poly, Swienty on August 19, 2016 by David.